When the 2019 recipient of the Prince Albert Chamber of Commerce Legacy Award set out to purchase her first pharmacy, she was met with a lot of resistance. Roses Stewart moved to Prince Albert in the mid-1970s after graduating from the College of Pharmacy at the University of Saskatchewan. She worked in Prince Albert and surrounding areas, including a far north as La Ronge and as far south as Birch Hills. In 1994, Summit Pharmacy at Victoria Square was put up for sale. 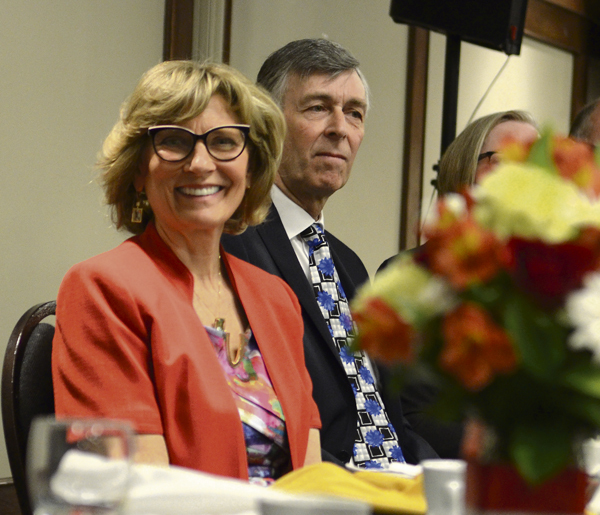 “I made the immediate decision, come hell or high water, that I would purchase it,” she told Chamber of Commerce members at the annual Legacy Brunch Thursday at the P.A. Inn. As Stewart sought financing, she was dismissed by bankers. “At that time — at least in my experience — there was an attitude in the banking world that a divorced woman with three children could not manage a business in uh a tough industry,” she said. Stewart stuck with her guiding phrase — “stay calm, be brave and wait for the signs”— and kept pushing. Eventually, she met with someone from Scotiabank who believed in her. “She had a little bit of influence,” Stewart explained. With that recommendation and some help from her parents, Stewart was able to gather enough funds to purchase the 300 sq. ft. pharmacy. “While signing the lease, the CEO of the health authority asked me with great concern, ‘how will you manage this?’” Stewart remembered. After five years in that 300 sq. ft. space, the health board wanted space for another project and moved Stewart to the front of the building. Her space tripled in size, and she was able to bring in a drive-thru window, at the time, a novel service in pharmacy. She also used the excess space to build a compounding room with external ventilation and a sterile area. “At the time, this was a big step forward for Canadian pharmacies,” Stewart explained. Compounding is the science of creating personalized medicine for people who are allergic to drug fillers, for those seeking a medication that has a shortage, or for someone who isn’t adequately served by mass-produced mediation. 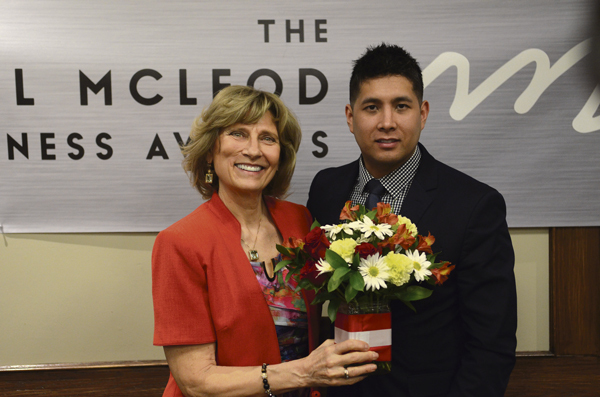 “Compounding is a personal, individualized service that puts a person’s needs first, and helps fill certain gaps,” said Guillermo Quinones Meza from Scotiabank as he introduced Stewart to the chamber of commerce audience Thursday. Compounding allows pharmacists to use things like special flavourings, unique dosage forms or innovative delivery methods to help provide customized care. For Stewart, compounding allowed her business to continue to grow. She purchased a packaging machine which allowed medications to be packaged by unit dose, reducing medication errors. She brought in a new computer system to make that process more efficient. Each time, her staff stepped up to learn how to adjust to the changes. Stewart thanked Dorothy Sanderson, one of her staff members, for implementing her vision. “My staff … rose to the challenge,” Stewart said. But she wasn’t done there. In 2009, she had a vision of doing something even bigger. “With a great deal of help from my son Steve, we embarked upon what would be, for me, the greatest project ever,” Stewart said. While running her business and working full time, Stewart and her family also spent hours with architects, engineers and building consultants, creating the new Victoria Square. The project was well underway before the secured the required financing thought Business Development Canada. “When the decision was made, it was a matter of dive in, start swimming, and whatever happens, don’t stop,” she said. The new building opened in 2011. In addition to a medical building and a café, the new facility featured a 5,000-foot pharmacy, complete with a thousand square foot space dedicated to compounding, including a lab and a sterile compounding room. Now, Stewart said, she can provide things such as transdermal pain medications, sterile eyedrops, spine injections that help with pain, specialty nasal sprays and other health products for all. ‘Every day is a new opportunity for new research and new products we can make,” she said. All that growth, though, was only possible because of the community’s support. That’s why, Stewart said, she was so happy to give back, supporting projects and organizations such as the E.A. Rawlinson Centre and Mann Art Gallery, The Herb Basset Home, Pineview Terrace, Mont St. Joseph Home, the Alfred Jenkins Fieldhouse, the skateboard park, mental health organizations and individual musical, sporting and cultural activities. She’s also made an impact on her staff. Quinones Meza spoke to some of them, and they gushed with praise for Stewart’s caring nature. “They felt taken care of,” he said. With all of Stewart’s contributions, chamber of commerce CEO Elise Hildebrandt said there was no doubt Stewart was the right choice for the legacy award. 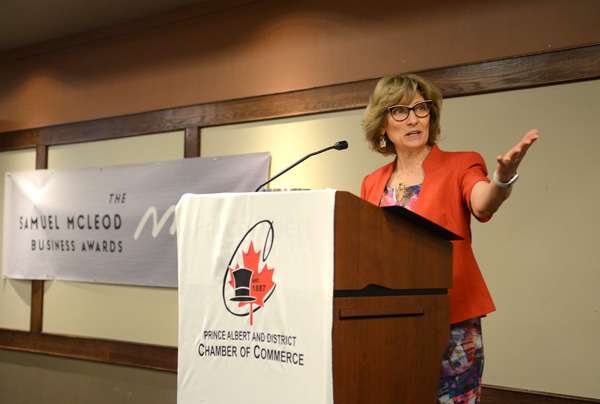 The award honours a member of the business community “responsible for major development within the City of Prince Albert, and someone who has had a hand in making Prince Albert and district a better place to live through their contributions,” she said. For her part, Stewart had trouble putting into words what it meant to receive the honour. “I’m filled with deep gratitude to be selected because my name is on a list with some of the most amazing people of our community,” she said. She took the opportunity to thank all of the people who have made her life in Prince Albert “phenomenal. “A local business joyfully supports its community,” she said. She told the gathered crowd that they are filled with high potential. “you have an obligation to share your genius and your insight,” Stewart said. She stepped away from the podium and took a breath, leaving the crowd with the words of late Canadian poet Patrick Lane.